For the first time in the history of the Women’s Flat Track Derby Association’s current ranking system, there is a new world number one. New York’s Gotham Girls, who held the title for five straight years, since the inception of the WFTDA division system in March 2013, have finally been bumped from the top position by Australia’s very own Victorian Roller Derby League (VRDL). VRDL is no stranger to breaking new ground. Founded in 2007, VRDL was the first league in Australia and the Southern Hemisphere to be admitted into Women’s Flat Track Derby Association Apprentice Program, graduating and gaining full membership in December 2011. It was 2013 that proved to be the beginning of a massive year for the Australian roller derby league. VRDL went four for four during their first big international tournament the Big O in Oregon, advancing from 38th worldwide to 31st in the space of a month as well as moving from Division II up to Division I. In July of that year a team ranking of 31st earned them their first playoff berth eventually coming fifth in their division with and an eventual WFTDA ranking of 21st worldwide. The following year proved to be much of the same for the VRDL as they yet again decimated the Big O tournament earning themselves another WFTDA playoff berth and jumping to 5th in the world rankings by the June 30, 2014 announcement that marks the end of the regular season. 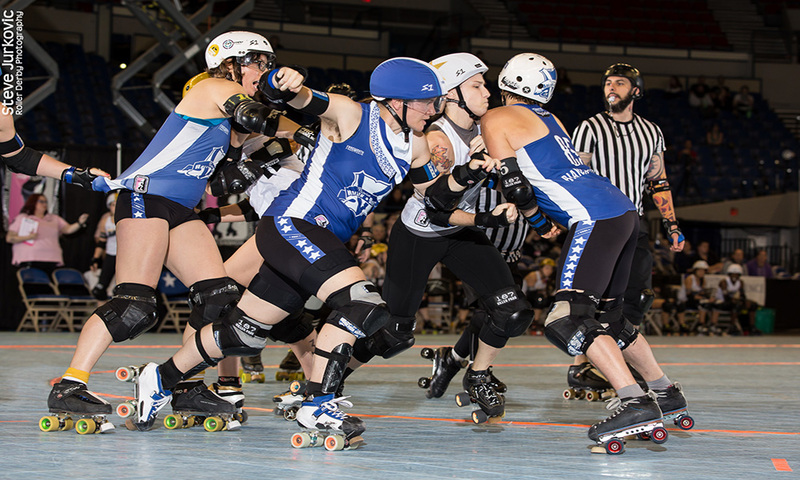 During the VRDL’s second playoffs they finished second in their division behind the Rose City Rollers who came into the tournament ranked 4th worldwide. From there the VRDL advanced to their first WFTRD Championship. Victoria would end up being knocked out in the second round by London Roller Girls after taking a 169 to 122 victory over Minnesota. In 2015 the Victorians set out to prove their worth once again. They finished first in their division to gain automatic qualification for round two of the championship where they would beat the Texas City Roller Girls 181 to 85 before being taken out in the semi-finals by the Gotham Girls Roller Derby with a two point margin. Being a decider between the two teams, VRDL eventually took out 3rd place. This would be a trend that would follow VRDL into 2016 when yet again, despite their second in world rankings, they would be knocked out in the semi-finals, this time by the Rose City Rollers who would go on to beat out Gotham in their quest for the Hydra Trophy. This year, however, is turning out to be a little different for VRDL with the team winning their first four games of the year during the 2017 Big O competition in Oregon. This included a a hotly contested match against the Rose City Rollers in which the Australian team came out on top by a 64 point margin. Their performance at this year’s Big O has bumped them into the world number one ranking, taking Gotham out of the top spot for the first time in WFTDA ranking history. With Victoria’s only loss in both of the last two seasons coming during the championship round they will be looking to carry the world number one ranking and their winning luck with them through to the playoffs in September and hopefully into the championship in Philadelphia come November. If all things go to plan, VRDL will return home as the first non-American team to raise the Hydra Trophy.